Waterspout in Liguasan River in Maguindanao region of Philippines has killed 10 people including two children when a passenger boat sank. An avalanche in Canada’s Glacier National Park near Revelstoke has claimed the life of one skier. Canadian Avalanche Centre has rated this avalanche 2.5 (from 1 to 5). 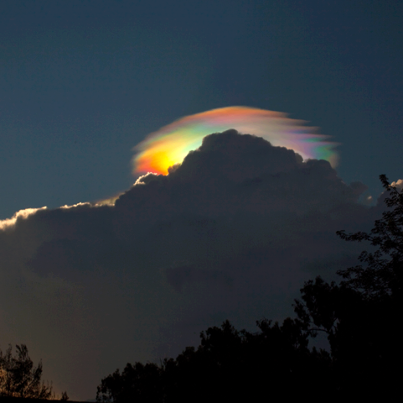 An extremely rare rainbow-colored pileus iridescent cloud over Ethiopia. Photo credits – Esther Havens. El Hierro (Canary Islands, Spain): The likelihood of a new submarine eruption in the near future is increasing. Earthquakes and pulsating strong tremor continued with little changes, indicators of magma intruding into new dikes in the western rift zone. There is also a trend towards stronger quakes (about 20 magnitude 3+ events including a M4 this morning) and shallower earthquakes (many at around 11-12 km depth today). This suggests that magma is slowly breaking pathways upwards, i.e. towards the seafloor. The area has remained about 5 km off shore NW from the western tip of the island, ie. under the submarine prolongation of the volcano’s western rift zone. This is where now a new eruption should be expected, if the magma does not decide to migrate laterally once again. Paluweh (off Flores Island, Indonesia): The lava dome remains active and regularly produces explosions and collapses with possible pyroclastic flows. VAAC Darwin reported an ash plume to 10,000 ft (3 km) altitude and extending 30 nautical miles to the west this morning. Lokon-Empung (North Sulawesi, Indonesia): A series of 3 moderately large explosions occurred this morning between 05:12 and 07:30 local time, and was followed by small ash emissions during the whole morning. The largest eruption produced an ash column rising about 2 km above the crater. Popocatépetl (Central Mexico): Activity has remained similar to previous weeks. The number of small explosions has risen a bit yesterday (1-2 per hour), and some of them were strong enough to eject glowing bombs to up to 500 m distance from the crater and creating ash plumes rising to about 23,000 ft (7 km) altitude or 1-1.5 km above the crater, drifting east. At night, glow continues to be visible, and a significant SO2 emission, both of which confirm that fresh magma is rising into the growing lava dome. Telica (Nicaragua): Earthquake activity in the ongoing seismic swarm remains very high and there have been a few magnitude 2+ quakes at shallow depths today as well. There has not been any report from INETER yet. Heard (Australia, Southern Indian Ocean): A significant heat source continues to show up on MODIS satellite data. A recent (9 March) EO1-Hyperion (NASA) satellite picture shows what could be a lava lake in the summit crater of Mawson Peak. This would be something in the line of the little what is known about the typical activity of Heard volcano, which has now been in eruption probably since end of September 2012. 5.2 Earthquake hits the Samoa Islands. 5.1 Earthquake hits the Santa Cruz Islands. 5.1 Earthquake hits south of Sumbawa, Indonesia. 5.0 Earthquake hits south of Sumbawa, Indonesia. 5.0 Earthquake hits Kepulauan Sangihe, Indonesia. 5.0 Earthquake hits the Fox Islands in the Aleutian Islands. Landslide in west Bandung region of Indonesia has claimed six lives. 18 villagers are reported to be still missing. The landslide buried nine houses in Cililin village of West Bandung, Java. Heavy rainfall has caused flooding in Dar city in Tanzania. The worst hit area is Kigogo. The rain also destroyed bridges in Kinyerezi and Vingunguti. 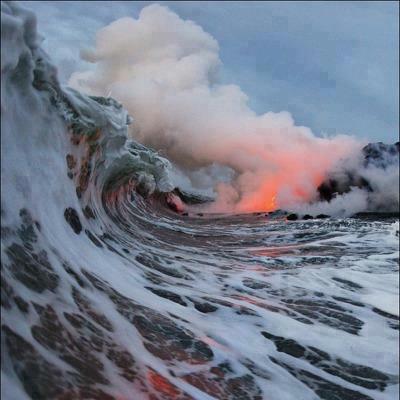 Dramatic shot of a wave over lava. Photographer braved 110 degree F waters and magma to get the shot. 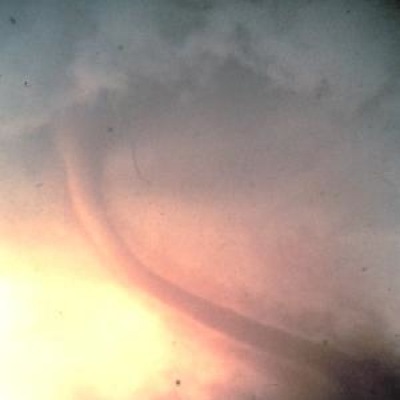 A remarkable photo showing a deadly twister in action as it rips up the ground and anything in its path of destruction. 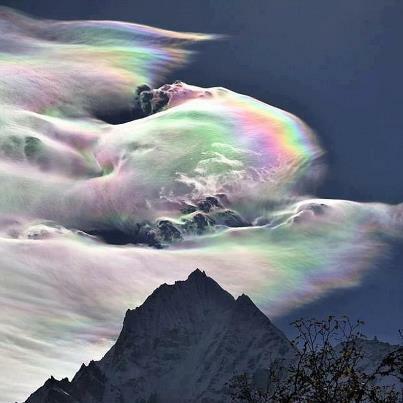 Amazing Rainbow Clouds. Unfortunately no location was disclosed. 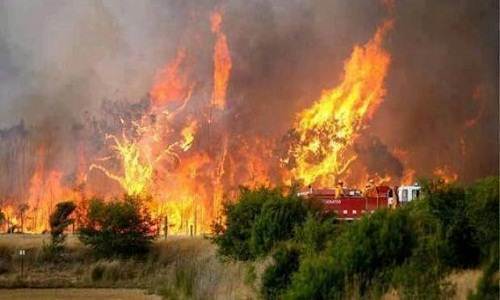 Forest fire in San Luis Potosi, Mexico has killed one woman. The victim couldn’t successfully fight the fire and died due to carbon monoxide poisoning in Tamuin. Around 11 forest fires are currently burning across San Luis Potosi. Multiples forest fires have burned 2,500 hectares and displaced more than 400 people. El Hierro (Canary Islands, Spain): The earthquake swarm continues with little changes. Most epicenters have remained in an area at about 15-17 km depth a few km NW off the western tip of the island. Volcanic tremor, suggesting magma movements, is continuous with strong pulses every few hours. Earthquake count today (only magnitudes >2): 111 A strong pulse of volcanic tremor has started, accompanied by a 3.2 magnitude quake at 15 km depth at 09:40 GMT. It seems that magma is continuing to move, and the scenario of a possible new eruption is becoming more and more likely. Bagana (Bougainville Island, Papua New Guinea): (23 Mar) A strong SO2 plume today suggests increased activity at the volcano. Ulawun (New Britain, Papua New Guinea): (23 Mar) Increased SO2 emissions from Ulawun and Bagana volcanoes are visible today on satellite data. 6.1 Earthquake hits east of the Kuril islands off Kamchatka. A state of emergency has been declared due to heavy snowfall in Kiev, the capital city of Ukraine. 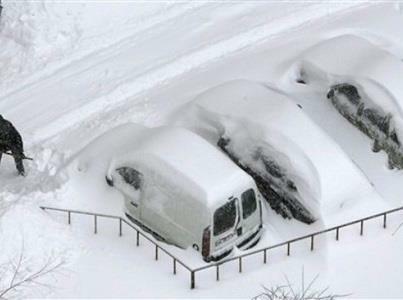 Kiev received 20 inches of snow in a 24-hour period. This is what Kiev usually receives per month during this season. Winter Storm in Britain Continues. Numerous roads in many regions became impassable after snow on Friday and Saturday. For Sunday the Met Office has warned that lying snow in many areas will melt on roads and pavements by day, refreezing by night to give icy patches. Some places, mainly in eastern England, will continue to get light snow, possibly up to a couple of inches. Also, snow blowing off fields in strong to gale force winds will affect some roads, especially over high ground. Up to 18,000 properties in Northern Ireland, 10,000 in Scotland and 2,000 in Wales have been without power overnight despite efforts by energy firms to reconnect them. Weather warnings also remain in place across much of the UK after two days of wintery conditions. Two people are known to have died – one in Lancashire and one in Cornwall. Baseball-sized hail and an early spring snowstorm forced the cancellation of more than 100 flights at Denver International Airport and closed several roads Saturday as it moved eastward, dumping more than a foot of snow in some places. The major early spring storm brought heavy snow, severe thunderstorms and floods as it moved east across the United States on Saturday, closing highways, forcing flight cancellations and causing a pileup involving dozens of vehicles. Blowing and drifting snow closed several roads in Colorado, including Interstate 70 in both directions east of Denver to the Kansas state line. Three soldiers have died after struck by lightning Saturday afternoon at Upper Orakzi agency in Pakistan. Five others were injured. 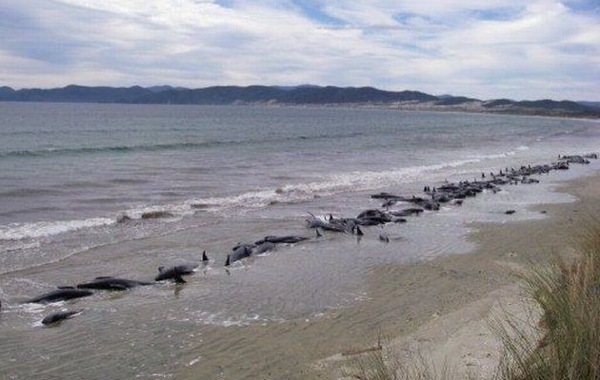 Nineteen pilot whales were beached at Noordhoek Beach in Cape Town on Sunday morning. Five of the whales had died, but police, sea rescue and other services were on scene trying to hose down the 14 surviving whales. The National Sea Rescue Institute said attempts were being made to help rescue the surviving whales. “The option being looked at, if possible, is to try and refloat them or to have them driven to the naval base in Simonstown and have them taken out to sea”. A wildfire broke out on Bultfontein north of Johannesburg today in dry conditions. The fire burned approximately 100 acres and did not damage any structures. Stromboli (Eolian Islands, Italy): An increase in activity has occurred today. Lava overspills wide area of the rims of the NE crater, causing lava overflows and numerous rockfalls descending down the Sciara del Fuoco. Tremor and explosion signals have increased in strength. El Hierro (Canary Islands, Spain): The scenario of an eruption in the near future is becoming increasingly likely: Volcanic tremor continues, suggesting magma is still moving although mostly laterally for the time being to an area just north off the western tip of the island. Tolbachik (Kamchatka): Activity continues essentially unchanged: strombolian explosions accompany the effusion of fluid lava flows from the southern fissure of Tolbachinsky Dol. The flows spread into 2 distinct fields to the west and the east and are well visible on satellite data. KVERT reports that the tremor amplitude remains oscillating between medium to high levels, at about 1/3 of their level during the start of the eruption. Batu Tara (Sunda Islands, Indonesia): For several days in a row, ash plumes have been spotted at 10,000 ft (3 km) altitude. The volcano, in near-continuous strombolian activity since 2006, has apparently stepped up the frequency of larger explosions although perhaps part of this might be explained by better meteorologic conditions allowing to detect ash plumes. Colima (Western Mexico): Small explosions from the growing dome, associated rockfalls and volcanic earthquakes have continued to increase in amplitude and frequency during the past days and weeks. Popocatépetl (Central Mexico): No big changes in activity have occurred. Emissions of gas-steam-sometimes small amounts of ash have remained less than 1 per hour on average (yesterday). The today’s seismogram shows tiny volcano-tectonic earthquakes and what seems to be a phase of slightly elevated tremor. A hot spot is visible on recent MODIS satellite imagery, corresponding to the growing lava dome, which continues to produce visible glow at night as well. Telica (Nicaragua): The seismic swarm continues with no changes. Hundreds of tiny quakes up to magnitudes around 2 have been occurring for the past days, but no reports have become available (so far). 5.2 Earthquake hits the Kermedec Islands. 5.2 Earthquake hits the south-western Atlantic Ocean. 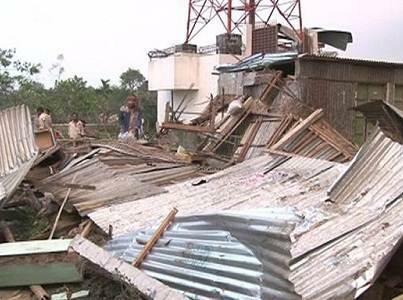 A tornado has claimed 20 lives in Bangladesh, injuring more than 500 others. The tornado overturned a bus, damaged houses and buildings and uprooted trees and destroyed crops. Affected areas are Sadar, Bijoynagar and Akhaura Upazilas of Brahmanbaria districts. The Met Office has issued amber warning for heavy rain in south-west England and snow in Wales and Northern Ireland. There are currently 12 flood warnings in the South West of England. A woman is said to be trapped in a landslide in Looe, Cornwall. Sandstorms have shut four Seaports in Egypt. The Egypt Meteorological Authority (EMA) recorded wind speed at 35 km/hr. Nine districts of Tak, Thailand have been declared as drought disaster zones.